Ollie’s nursery was well on it’s way to being completed many months ago, well before he was even close to being fully cooked. We knew if it didn’t get done before he was born it would never be completed. Now that he’s here, I’m gathering ideas to put the finishing touches on the space. With fall on its way I know we will be spending more than our fair share of days indoors and I want to get his room feeling like a place where we’d want to spend our days laughing and learning together. My answer to that is to create a reading nook. Reading is an activity we’ve shared together as a family since he was in the womb and now that he’s here we cuddle together every night before bed and read some stories and he stares at the pictures. It’s so lovely. I want to be able to have a few books on display, almost as art work. I want to use a piece of dancing moulding as a ledge to rest the books against the wall without them toppling over. Our comfort is key or else the space is useless. Big feather stuffed pillows with geometric patterns in bright colours will cover the area so we can lay down and snuggle. 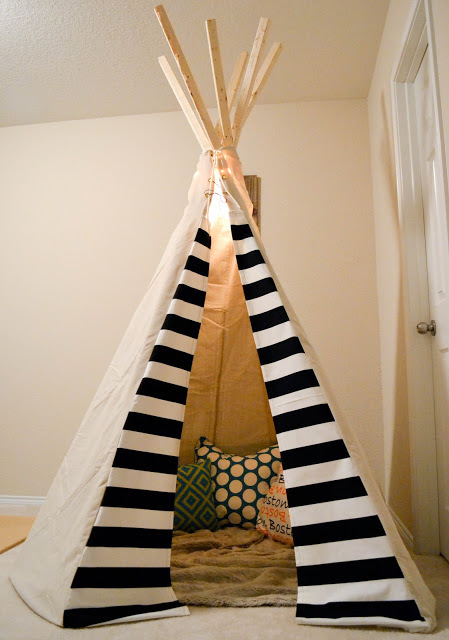 I can picture a little reading teepee in the space but from what I’ve seen in the blog world, the traditional teepee shape takes up some valuable real estate in terms of Ollie’s room. I’m going to need to fan-dangle it so it can fold up and be put in a closet or behind the door! Are you noticing a theme here? BLACK AND WHITE STRIPES! We are really loving the simplicity. Not to mention you can pair it with any other colours and it looks great. It’s so classic and clean! A trip to IKEA is in our near future. I’ll update you once things come a little further together.